Previous studies have shown that substitution of single amino acid residues in human Melan-A immunodominant peptides Melan-A27–35 and Melan-A26–35 greatly improved their binding and the stability of peptide/HLA-A*0201 complexes. In particular, one Melan-A peptide analogue was more efficient in the generation of Melan-A peptide-specific and melanoma-reactive CTL than its parental peptide in vitro from human PBL. In this study, we analyzed the in vivo immunogenicity of Melan-A natural peptides and their analogues in HLA-A*0201/Kb transgenic mice. We found that two human Melan-A natural peptides, Melan-A26–35 and Melan-A27–35, were relatively weak immunogens, whereas several Melan-A peptide analogues were potent immunogens for in vivo CTL priming. In addition, induced Melan-A peptide-specific mouse CTL cross-recognized natural Melan-A peptides and their analogues. More interestingly, these mouse CTL were also able to lyse human melanoma cell lines in vitro in a HLA-A*0201-restricted, Melan-A-specific manner. Our results indicate that the HLA-A*0201/Kb transgenic mouse is a useful animal model to perform preclinical testing of potential cancer vaccines, and that Melan-A peptide analogues are attractive candidates for melanoma immunotherapy. The recent characterization of tumor Ags that can be recognized by CTL (and/or give rise to immune reponses capable of destroying cancer cells) has opened new opportunities of immunotherapy and development of Ag-specific cancer vaccines. Tumor Ags are products of genes specifically overexpressed or mutated in tumor cells, or normal differentiation proteins that are expressed in a cell lineage-specific manner 1, 2 . Remarkably, most of these Ags have been identified in melanomas, and the majority of CTL epitopes defined to date are associated with HLA-A*0201, the major subtype expressed in most of the major ethnic groups. The human Melan-A/MART-1 (Melan-A) Ag is a cell lineage-specific tumor Ag that has been independently identified by two groups 3, 4 . Like tyrosinase 5 , gp100 6, 7 , gp75 8 , and other lineage-differentiation Ags, Melan-A is expressed only in melanomas and normal melanocytes. Melan-A is expressed in nearly all melanoma tumor samples and in 60% of melanoma cell lines. Melan-A-specific CTL are frequently found in both PBMC and tumor-infiltrating lymphocytes (TIL)3 from HLA-A*0201 melanoma patients 3, 9 . 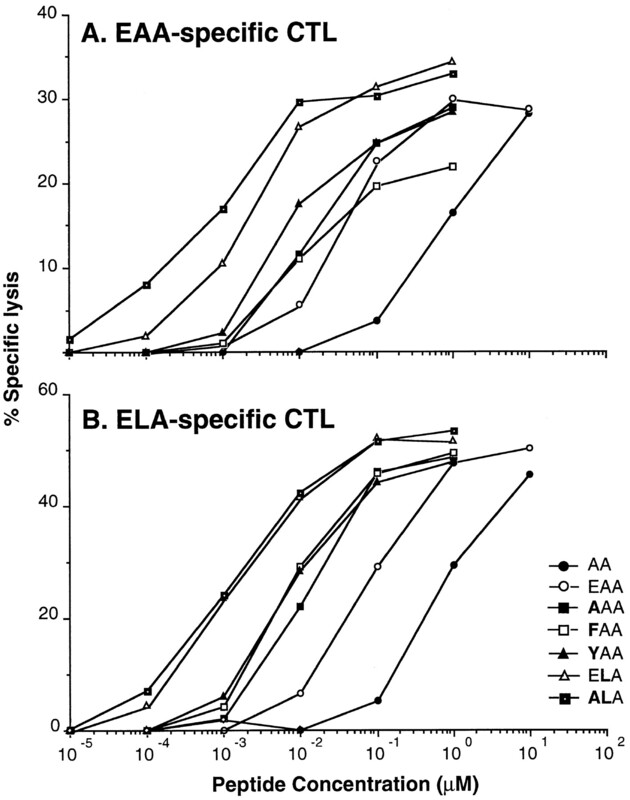 Four HLA-A*0201-restricted peptides corresponding to Melan-A sequences in positions 27–35, 27–36, 26–35, and 32–40 have been defined and tested for their recognition by CTL lines or clones derived from TIL of melanoma patients and from PBMC of normal HLA-A*0201 donors 9, 10, 11, 12 . While the Melan-A26–35 peptide is recognized more efficiently than Melan-A27–35 by TIL of different melanoma patients, Melan-A27–36 is only poorly recognized and Melan-A32–40 is not recognized at all 11, 12 . These observations suggest that the Melan-A26–35 and Melan-A27–35 peptides are immunodominant in the context of the HLA-A*0201 allotype and thus are potential candidates for the development of melanoma-specific vaccine. However, although the data on the relative immunogenicity of these two peptides in vitro are controversial 12, 13, 14, 15, 16 , they are poorly immunogenic in vivo 13, 17 . One explanation of the weak immunogenicity of these Melan-A-derived peptides could be their poor binding to HLA class I molecules 18 or the low stability of peptide/MHC complexes 19 . Indeed, the lack of one of the dominant anchor amino acid residues (leucine or methionine) at position 2 of both peptides and the presence of a negatively charged amino acid at position 1 of peptide Melan-A26–35 20 render these two peptides relatively poor binders to HLA-A*0201, although the decapeptide Melan-A26–35 binds slightly more efficiently than the nonapeptide Melan-A27–35 11 . In addition, it has been shown that the complexes formed between HLA-A*0201 and these two peptides are unstable, with a t1/2 lower than 1 h at 37°C 12 . The improvement of binding capacity and/or peptide/MHC complex stability may be achieved by substituting anchor residues of the original poor binder peptide with optimal amino acid residues 11, 12, 21, 22 . It has been reported that gp100-derived peptide analogues with better binding capacity than their parental counterparts became more immunogenic in terms of in vivo CTL priming and in vitro recognition by specific gp100 CTL derived from melanoma patients 21, 22 . In the case of Melan-A, single amino acid substitutions at position 1 (E→Y or E→F) or 2 (A→L or A→M) of the natural decapeptide Melan-A26–35 greatly enhanced binding to HLA-A*0201, stability of peptide/HLA-A*0201 complexes, and efficiency of recognition by Melan-A-specific human CTL 11, 12 . Furthermore, Melan-A peptide analogues are more potent than the natural peptides to generate tumor-reactive CTL upon in vitro stimulation of PBMC from melanoma patients 12 . However, the relative immunogenicity of these peptide analogues compared with the natural ones in vivo remains unknown. Clearly, an evaluation of the efficiency of peptide analogues as immunogens in vivo would be useful in terms of designing potent cancer vaccines for humans. To address these questions, we have chosen an experimental model of human class I transgenic mice. Human class I transgenic mouse models have been successfully used to determine the immunogenicity of human CTL peptides derived from viral or tumor-associated Ags 23, 24, 25 and to identify or predict human CTL epitopes 26, 27, 28, 29 . Data gathered from these studies showed that the immunogenicity of peptides in vivo is well correlated with the in vitro human CTL activity. Most of the mentioned reports used HLA-A*0201/Kb transgenic mice. These transgenic mice express a chimeric MHC class I molecule composed of human HLA-A*0201 α1 and α2 domains and mouse Kb α3, transmembrane and cytoplasmic domains 23 . The substitution of the α3 domain of A2.1 molecule with a mouse counterpart provides suitable interaction sites for the mouse CD8 coreceptor and might also favor class I MHC function through its binding to the mouse β2-microglobulin. Altogether, chimeric class I molecule transgene expression leads to an increased HLA-A*0201-restricted CTL responsiveness in mice 30 . In the present study, the in vivo immunogenicity of human Melan-A natural peptides and peptide analogues was evaluated in HLA-A*0201/Kb transgenic mice. A homologue of the human Melan-A gene is endogenously expressed in the mouse 31 . The mouse putative protein contains 113 amino acids with 68.8% identity to the human one. The two overlapping HLA-A*0201-restricted epitopes map to residues 25–33 and 24–33, which are highly homologous to the human Melan-A27–35 and Melan-A26–35 peptides, respectively, with only one amino acid difference (human Melan-A26–35 = EAAGIGILTV, mouse Melan-A24–33 = EAAGIGILIV). It is conceivable that the endogenous expression of these Melan-A peptides in HLA-A*0201/Kb transgenic mice could influence the TCR repertoire available against human natural Melan-A peptides. Our results demonstrate that human natural peptides were relatively poorly immunogenic, while peptide analogues with modified binding/stability features are more potent immunogens than their parental peptides in vivo. In addition, Melan-A peptide-specific CTL generated in transgenic mice cross-recognized not only the natural Melan-A peptides, but also recognized human melanoma cells in an HLA-A*0201-restricted Melan-A-specific manner. Mouse EL-4 cells transfected with HLA-A*0201/Kb gene (EL-4.A2/Kb transfectants) 32 were kindly provided by Dr. Linda Sherman (Scripps Clinic and Research Foundation, La Jolla, CA) and maintained in DMEM supplemented with 1% HEPES, 1% strepto-penicillin, 10% heat-inactivated FCS, and 0.5 mg/ml G418. Human melanoma cell lines Me 290 and Me 260 were established at the Ludwig Institute for Cancer Research, Lausanne Branch, from surgically excised melanoma metastases, as described 12 . Human melanoma cell line NA8 3 was kindly provided by Dr. Francine Jotereau (Institut National de la Santé et de la Recherche Médicale, Nantes, France). All human melanoma cells were maintained in RPMI 1640 medium supplemented with 10% FCS. Peptides were synthesized by standard solid-phase chemistry on a multiple peptide synthesizer (Applied Biosystems, Foster City, CA) by using standard F-moc for transient NH2-terminal protection and analyzed by mass spectrometry. All peptides were >90% pure, as indicated by analytical HPLC. Lyophilized peptides were diluted in DMSO and stored at −20°C. The HLA-A*0201-restricted natural and peptide analogues used in this study are listed in Table I⇓. Breeding pairs of HLA-A*0201/Kb transgenic mice (Line 6) 23 were kindly provided by Harlan Sprague-Dawley (Indianapolis, IN). Different immunization protocols were used. An IFA-priming protocol described elsewhere 33 was used to generate strong CTL responses in mice. Briefly, HLA-A*0201/Kb transgenic mice were preinjected s.c. with an emulsion of IFA at the base of the tail in a total volume of 50 μl. Three weeks later, these mice were immunized s.c. with Melan-A peptides emulsified in IFA. Ten days after injection, mice were sacrificed and lymphocyte suspensions from draining lymph nodes (LN) were prepared for in vitro stimulation with the relevant peptides. In some experiments, mice were directly immunized (without IFA prepriming) with Melan-A peptides emulsified in SBAS2 adjuvant (provided by Dr. S. Cayphas of SmithKline Beecham, R&D Systems, Rixensart, Belgium). SBAS2 is a mixture of a natural saponin, QS21, and of a detoxified form of LPS, the monophosphoryl lipid A, in an oil water emulsion 34 . LN cells (4–5 × 106) were cultured with 2–5 × 105 irradiated (10 krad) EL-4 A2/Kb cells, prepulsed with 1–10 μM of stimulating peptides for 1 h at 37°C, in 24-well cell culture plates in 2 ml of DMEM medium supplemented with 10 mM HEPES, 50 μM β 2-ME, 10% FCS, and EL-4 cell culture supernatant containing 30 U/ml of IL-2. After one or two rounds of weekly stimulation, the cultured cells were tested for cytolytic activity. Cytolytic activity of specific CTL was determined in a 51Cr release assay. Target cells were labeled with 51Cr for 1 h at 37°C in the presence or absence of tested peptides, then washed and coincubated with effector cells at the indicated lymphocyte to target cell ratio in V-bottom 96-well plates in a total volume of 200 μl DMEM medium. In the Ag titration experiments, labeled target cells were incubated in the presence of various concentrations of peptide for 15 min before the addition of the effector cells. Chromium release was measured in 100 μl of supernatant harvested after 4–6 h of incubation at 37°C. The percentage of specific lysis was calculated as following: % specific lysis = [(experimental release − spontaneous release)/(total release − spontaneous release)] × 100. In the first set of experiments, groups of HLA-A*0201/Kb transgenic mice were first injected with IFA. Three weeks later, these mice were immunized s.c. with the relevant Melan-A peptides listed in Table I⇑ in the presence of a Th peptide P30 derived from tetanus toxin 947–967 35 . Ten days after immunization, the draining LN cells were stimulated in vitro with the immunizing peptides. After one round of in vitro stimulation, strong CTL responses to Melan-A analogues were observed in each peptide analogue-immunized mice, while no specific response was detected in the natural Melan-A peptide groups (Fig. 1⇓A). After the second round of stimulation, CTL activity specific for human Melan-A27–35 and Melan-A26–35 natural peptide became detectable and the CTL activity against peptide analogues was maintained or even increased further (Fig. 1⇓B). No CTL response against natural peptides or peptide analogues was obtained with lymphocytes coming from nonimmunized mice regardless of the number of in vitro stimulations (data not shown). In similar experiments performed with mouse natural Melan-A peptides, no CTL response was detected even after three rounds of in vitro stimulation (data not shown). These results indicate that the human Melan-A natural peptides or peptide analogues tested are immunogenic in vivo and that peptide analogues are more potent at inducing specific CTL responses than their parental counterparts. However, the inability to induce CTL against mouse peptides suggests that the T cell repertoire specific for these endogenous peptides has been tolerized in the mouse. Specific CTL responses in HLA-A2/Kb transgenic mice immunized with Melan-A natural peptides or analogue peptides in presence of a Th peptide. Draining LN cells from immunized mice were restimulated once (A) or twice (B) with the indicated Melan-A natural peptide or peptide analogue and tested for their cytolytic activity against A2/Kb-transfected EL-4 cells in presence (closed symbol) or in absence (open symbol) of specific peptide in a chromium release assay. One essential requirement for using more immunogenic peptide analogues instead of the natural ones for vaccination is that the former are able to elicit specific CTL that cross-recognize the natural peptides. To address this issue, the draining LN cells from transgenic mice immunized with peptide analogues Melan-A26–35 E26A, Melan-A26–35 E26Y, Melan-A26–35 A27L, and Melan-A26–35 E26A, A27L were stimulated once in vitro with the immunizing peptide and tested against both immunizing and natural peptides. As shown in Fig. 2⇓, CTL specific for the Melan-A26–35 and Melan-A27–35 natural peptides were generated after immunization with all analogues tested, although CTL obtained from Melan-A26–35 E26A, A27L-immunized mice displayed a slightly lower natural peptide-specific response. These results indicate that the analogues used in our study are more immunogenic than the Melan-A natural peptides in vivo and that CTL generated are able to cross-react with natural Melan-A peptides. Generation of CTL specific for Melan-A26–35 and Melan-A27–35 natural peptides in HLA-A2/Kb transgenic mice immunized with Melan-A peptide analogues in presence of a Th peptide. LN cells from transgenic mice immunized with the indicated Melan-A peptide analogues were restimulated once in vitro with the immunizing peptide and tested for their cytolytic activity 7 days later against A2/Kb-transfected EL-4 cells in absence or in presence of the indicated peptides. Since Melan-A peptide analogues were able to elicit specific CTL responses, the subsequent experiments were designed to examine the requirement of a Th peptide for efficient priming with Melan-A peptides. This would be important for simplifying the Ag preparation and vaccination procedure. Groups of HLA-A*0201/Kb transgenic mice were immunized with either Melan-A26–35 natural peptide or Melan-A26–35 A27L peptide analogue, in presence or absence of the Th peptide P30, in IFA emulsion or mixed in SBAS2 adjuvant 34 . As shown in Fig. 3⇓, in the case of immunization with Melan-A26–35 natural peptide, a specific CTL response could be induced only when Th peptide P30 was coinjected in IFA and not in SBAS2. In contrast, immunization with Melan-A26–35 A27L peptide analogue formulated in either adjuvant-induced specific CTL responses, regardless of the absence of P30, confirming the strong immunogenicity of this peptide analogue (Fig. 3⇓, A and B, lower panels). These results indicate that SBAS2 adjuvant is as equally effective as IFA for relatively good immunogenic peptides and raise the possibility to replace IFA by a safer adjuvant for clinical trials. Immunogenicity of Melan-A natural peptide or peptide analogue administered in two adjuvants with or without a Th peptide. IFA emulsions (A) or SBAS2 (B) were tested as adjuvant to induce a CTL response against Melan-A26–35 natural peptide or Melan-A26–35 A27L peptide analogue in presence or in absence of Th peptide (P30). Cytolytic activity of bulk cultures restimulated twice in vitro was measured against A2/Kb-transfected EL-4 cells in presence (closed symbol) or in absence (open symbol) of the Melan-A26–35 peptide (upper panels in A and B) or of the Melan-A26–35 A27L peptide analogue (lower panels). The Melan-A peptide-specific CTL were then assessed for their ability to recognize each of the Melan-A substituted or natural peptides. Dose-response curves were generated for each combination of CTL/antigenic peptide. Fig. 4⇓ illustrates the Ag dose titration curves obtained by specific CTL generated against Melan-A26–35 natural peptide (Fig. 4⇓A) or Melan-A26–35 A27L peptide analogue (Fig. 4⇓B), respectively. Importantly, Melan-A26–35 A27L-specific CTL efficiently cross-recognized both natural Melan-A peptide and peptide analogues. Similar results were obtained by using CTL specific for the other analogues tested. As shown in Table II⇓, the concentration of peptide required to sensitize the target cells for lysis by each CTL line is variable, as reflected by the peptide concentration required to achieve 50% of maximal target cell lysis (8–5000 nM). Interestingly, the immunizing peptides were not always the most efficient peptides to sensitize the lysis of target cells by the corresponding CTL line. In fact, among the seven Melan-A peptides tested, the two peptide analogues, Melan-A26–35 A27L and Melan-A26–35 E26A, A27L, were the most potent peptides for inducing lysis of EL-4.A2/Kb cells by all of the CTL tested, requiring a peptide concentration 20- to 700-fold lower than Melan-A26–35 natural peptide. Melan-A26–35 E26A, Melan-A26–35 E26F, and Melan-A26–35 E26Y peptide analogues were slightly more efficient (2- to 40-fold) than Melan-A26–35 natural peptide to induce the lysis of target cells, while the nonapeptide Melan-A27–35 was about 5- to 50-fold less efficient. Altogether, the above data demonstrate a clear cross-reactivity of CTL generated against Melan-A natural or peptide analogue. They also suggest the existence of a defined hierarchy in the antigenicity of this group of peptides that appears to be independent of the immunizing peptide. Specificity of CTL generated against Melan-A natural peptide or peptide analogue. 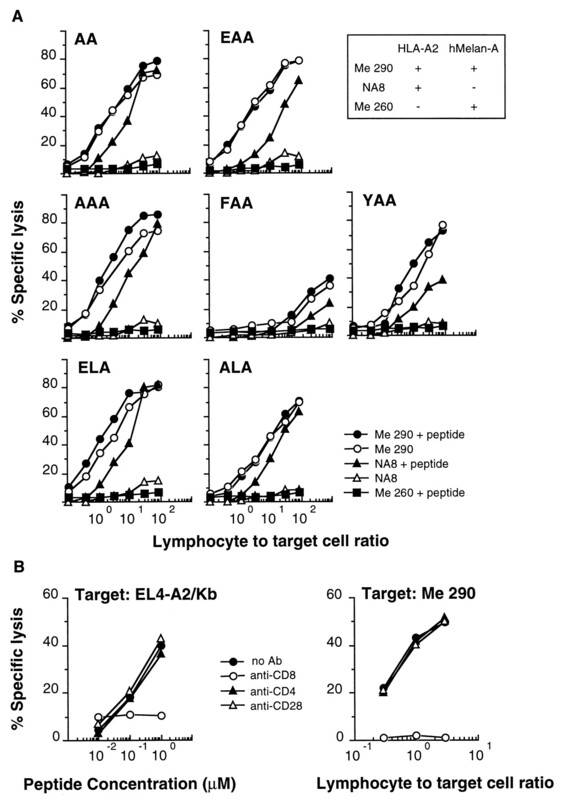 The cytolytic activity of CTL lines generated by immunizing and in vitro stimulating (four times) with Melan-A26–35 natural peptide (A) or with Melan-A26–35 A27L peptide analogue (B) is tested against A2/Kb-transfected EL-4 target cells pulsed with increasing concentrations of Melan-A natural peptides or Melan-A peptide analogues in a 4-h 51Cr release cytotoxicity assay at a lymphocyte to target cell ratio of 5:1. To determine whether the Melan-A peptide-specific CTL generated from HLA-A*0201/Kb transgenic mice were able to recognize Melan-A Ag endogenously processed and presented on the cell surface, we chose the HLA-A*0201-positive and Melan-A-expressing human melanoma cell line Me 290 as target for the cytolytic assay. As shown in Fig. 5⇓A, CTL induced by immunization with human natural Melan-A peptide or peptide analogues in transgenic mice were able to lyse Me 290 cells. No further increase of target cell lysis was observed when the relevant peptides were added to Me 290 cells, indicating that maximal tumor reactivity of CTL was already attained. The tumor lysis was due to the specific recognition of Melan-A endogenous peptide in the context of HLA-A*0201, since CTL recognized neither HLA-A*0201-positive Melan-A-negative human melanoma cell line NA8, unless the relevant peptides were added, nor HLA-A*0201-negative human melanoma cells Me 260 even in the presence of peptides (Fig. 5⇓A). Surprisingly, we also observed that the lysis of Me 290 by the mouse CTL was blocked efficiently by addition of anti-mouse CD8 mAb, while anti-mouse CD4 or CD28 mAbs did not influence the CTL activity. Similar results were observed when EL-4.A2/Kb cells pulsed with the relevant peptide were used as targets (Fig. 5⇓B). These results suggest that the lysis of Ag-expressing targets by mouse anti-Melan-A CTL is CD8-dependent and that the mouse CD8 seems to interact efficiently with the human HLA-A2 class I molecule. A, Recognition of human melanoma cells by mouse CTL specific for human Melan-A natural peptides or peptide analogues. CTL specific for the Melan-A natural peptides or peptide analogues were specifically restimulated twice in vitro before assaying and tested for their ability to lyse human melanoma cells HLA-A*0201+ Melan-A+ (Me 290), HLA-A*0201+ Melan-A− (NA8), and HLA-A*0201− Melan-A+ (Me 260) in a 4-h 51Cr release cytotoxicity assay in presence (closed symbols) or in absence (open symbols) of the corresponding immunizing/stimulating peptide, B, Inhibition of recognition of Me 290 melanoma cell line or of A2/Kb-transfected EL-4 cells pulsed with Melan-A26–35 natural peptide by mouse CTL clone specific for Melan-A26–35 natural peptide with anti-CD8, anti-CD4, and anti-CD28 mAbs. Among melanoma-associated Ags, Melan-A appears to be an immunodominant Ag in HLA-A*0201 melanoma patients since it is frequently recognized by lymphocytes derived from metastatic lesions and by PBMC stimulated in vitro with matched allogenic melanoma cells 3, 9, 36 . In addition, antimelanoma CTL activity has been generated by repetitive in vitro stimulation of PBMC from HLA-A*0201 melanoma patients with Melan-A27–35 13, 14 or with Melan-A26–35 15 , suggesting the feasibility of using Melan-A peptides for the development of peptide-based vaccines against melanoma. In the present study, we extend the observations in our previous studies on the immunogenicity of natural and Melan-A peptide analogues in vitro in humans 11, 12 to the evaluation of CTL responses induced by these peptides in vivo in a HLA-A*0201/Kb transgenic mouse model. Our data indicate that Melan-A peptide analogues are more immunogenic than natural peptides for induction of specific CTL responses in vivo. Furthermore, the CTL generated against Melan-A peptide analogues cross-react with the natural ones and are able to lyse melanoma cell lines in vitro in a specific manner, indicating that Melan-A peptide analogues are attractive candidates for peptide-based vaccines for the immunotherapy of melanoma. 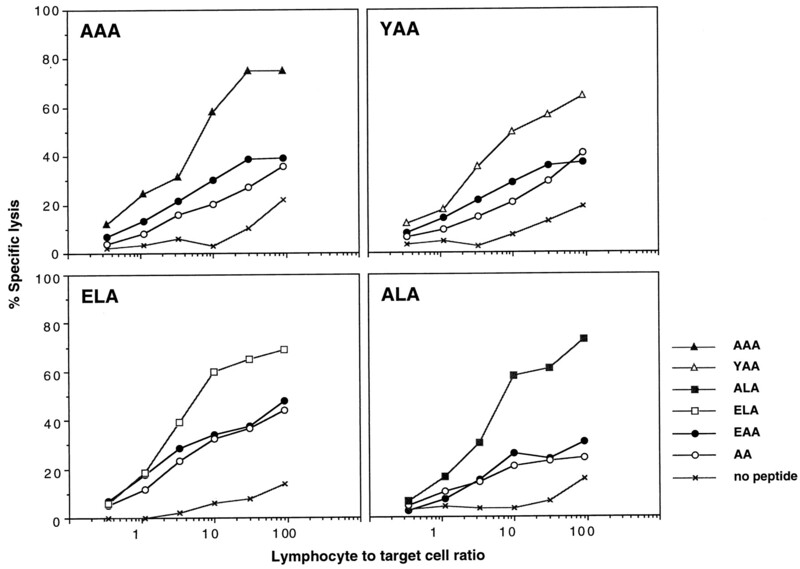 The consistency of our results with those of the in vitro stimulating capacity of Melan-A peptides for human lymphocytes highlights the relevance of HLA-A*0201/Kb transgenic mice as a model to predict the immunogenicity of human Melan-A peptides and to select within several candidates the most efficient one. Indeed, an extensive overlap between mouse and human CTL repertoires specific for various HLA-A2-restricted Ags has been suggested 37 , even if some diversity has been found in TCR usage in response to the influenza matrix peptide 38 . In addition, Ag processing and presentation machinery in transgenic mice and human cells are sufficiently similar to allow presentation of the same epitopes 18 . Based on the close correlation between the immunogenicity of peptides and their binding affinity and stability of peptide/MHC complexes 18, 19 , several authors have tried to modify residues involved in MHC binding without altering peptide-TCR contact residues. As a consequence, the amount of peptide-MHC complexes displayed at the surface of APCs in vivo might be increased, resulting in enhanced priming of specific CTL. In mouse models, the efficiency of vaccination with modified CTL peptides has been demonstrated for viral protection 39 , and the immunization of mice with a high affinity H-2Db-binding CTL epitope derived from human papillomavirus induced peptide-specific CTL able to lyse tumor cells in vitro and to protect mice from tumor challenge in vivo 40 . Improved in vitro and in vivo induction of melanoma-reactive CTL with peptides from the gp100 melanoma Ag modified at HLA-A*0201-binding residues has been reported in humans 21, 41 . It has also been shown that the Melan-A26–35 A27L peptide analogue is more immunogenic than the natural decapeptide in vitro in humans 12 . In this study, we show that substituted peptides at position 2 (A27L), at position 1 (E-26F, E-26Y, and E-26A), or at positions 1 and 2 (E26A A27L), defined as good binders to HLA-A2 molecules 11, 12 , are also more immunogenic than the natural peptides in vivo. Moreover, the immunization of HLA-A*0201/Kb transgenic mice with Melan-A26–35 A27L peptide analogue is efficient enough to generate CTL responses in the absence of P30 helper epitope, thereby simplifying the vaccine preparation. It should be emphasized that besides the critical role of binding affinity and stability of peptide/MHC complexes, the immunogenicity of peptides also depends on the available T cell repertoire. Since the melanoma-associated Ags studied are differentiation Ags endogenously expressed in normal melanocytes, we cannot exclude that the T lymphocytes specific for their derived peptides have been tolerized 30 . During negative selection, T cells specific for dominant peptides and/or expressing a high avidity of recognition are deleted 42 , whereas those specific for subdominant peptides and/or expressing a low avidity of recognition may remain in the periphery 43 . The weaker activity of low avidity T cells can be restored in vitro by adding exogenous IL-2 44 . However, several reports using other transgenic mouse models have shown that specific T lymphocytes may be allowed to go to the periphery and remain immunologically naive or ignorant to the transgene protein 45, 46 . In agreement with the hypothesis of active T cell tolerance against self Ag, we have observed the unresponsiveness to mouse natural Melan-A peptides in HLA-A*0201/Kb mice. This unresponsiveness is not likely due to the immunization protocol or adjuvant effect since vaccination of mice with mouse Melan-A recombinant adenovirus or vaccinia virus also failed to generate mouse Melan-A-specific CTL in contrast to the vaccination with recombinant vaccinia viruses encoding human Melan-A 31 . Interestingly, we have observed that immunization with mouse Melan-A peptide analogues can induce CTL response in those mice (data not shown). Altogether, these data indicate that the modification of natural Melan-A peptides allows to recruit more efficiently the responding CTL precursors remaining in the periphery and to circumvent the specific CTL tolerance againt natural peptides derived from self Ag. It has been reported that peptide-based vaccines were able to induce strong protective CTL-mediated immunity against tumors in animal models 40, 47, 48, 49, 50, 51, 52 . Interestingly, in our model, CTL induced against Melan-A peptide analogues are able to recognize the natural peptides and to lyse human melanoma cells, and thus might be involved in tumor regression. However, a recent report showed that immunization of melanoma patients with modified gp100 peptides, which are more immunogenic than the natural peptide in vivo, is not accompanied by significant cancer regression 41 . It is possible that Melan-A-specific CTL precursors, which remain in the periphery and are a priori of low avidity 43 , might only be suboptimally activated under the above-mentioned vaccination conditions in vivo, leading to a CTL response quantitatively insufficient for tumor regression. Consistent with this hypothesis, it has been shown that coinjection of gp100-modified peptides together with IL-2 leads to significant tumor regression in a high proportion of immunized melanoma patients 41 . An alternative explanation could be the induction of CTL unresponsiveness following peptide vaccination. In this connection, vaccination with a CTL epitope derived from the early region 1A of the human adenovirus type 5 (Ad5E1A) induced Ad5E1A-specific CTL tolerance, leading to enhanced outgrowth of Ad5E1A-transformed tumors in mice 53 . Different mechanisms have been suggested to account for the tolerance caused by peptide vaccination, including the route of immunization, the dose of peptide 55 , and the effect of certain adjuvants 53, 54, 55 . In this respect, the use of HLA-A2/Kb transgenic mouse model is crucial to determine the potentiality of immunity rather than tolerance induced by peptide-based vaccines. As essential to discriminate these contrasting outcomes will be the ability to follow the fate of specific CTL over time during the course of immunization and of tumor evolution. A promising tool to accomplish this has recently become available that consists of fluorescent A2/Melan-A tetramers 56 . Although IFA is theoretically efficient at enhancing the immunogenicity of peptides and proteins by activating costimulatory factors and mediating the production of cytokines, specific tolerance rather than immunity following injection of certain peptides in IFA has been reported 53, 55 . In addition, IFA is rather aggressive, frequently causing tissue injury as well as other side effects. Thus, safer and more potent adjuvants need to be found. In the present study, we have shown that SBAS2, which is well tolerated by humans 34 , is a potent alternative adjuvant of CTL response induction. Future studies taking advantage of the HLA-A*0201/Kb transgenic mouse model will enable the assessment of adjuvant activity of different preparations amenable for human use. Although natural human melanoma cells, which lack the mouse MHC α3 domain, were proposed to be less optimal for recognition by HLA-A*0201/Kb transgenic mouse CTL 29 , these cells were efficiently specifically lysed by Melan-A peptide-specific CTL generated in HLA-A*0201/Kb mice. Moreover, the addition of anti-CD8 mAb completely blocked the lysis of target cells. Although we cannot exclude the possibility that an inhibitory signal is induced by the binding of anti-CD8 mAb to mouse CTL, these results suggest the interesting possibility that mouse CD8 can efficiently interact with human class I α3 domains. It should be possible to map precisely the regions involved in these interactions. Taken together, the previous observations with human lymphocytes and our current data indicate that peptide analogues derived from Melan-A protein and presented in the context of HLA-A*0201 molecule are attractive candidates for development of peptide-based vaccines and for immunotherapy of melanoma patients. These analogues are more immunogenic than natural peptides in vitro in humans and in vivo in HLA-A*0201/Kb mice and are able to induce CTL efficiently recognizing the natural peptides. The efficiency of Melan-A peptide-based vaccination in mediating protection against tumor growth is currently addressed in HLA-A*0201/Kb transgenic mice in tumor challenge experiments in vivo. We thank Dr. K. Servis for peptide synthesis, Dr. F. Jotereau for providing human melanoma cell line NA8, and Dr. H. Acha-Orbea for critically reading the manuscript. ↵1 This work was supported in part by the Federal Office for Education and Science (OFES), Switzerland, and the European Community (Contract BMH4-CT95-1627). ↵3 Abbreviations used in this paper: TIL, tumor-infiltrating lymphocyte; LN, lymph node.